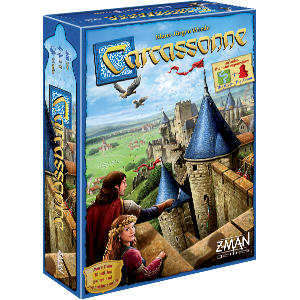 The Carcassonne Big Box is available now! A world of possibilities awaits you. This land is populated with all sorts of interesting people and exciting things to do. Once here, you’re just as likely to bump into a powerful witch or wizard as you are to see a fantastic flying machine soaring across the sky. Discover everything that this world has to offer with the Carcassonne Big Box, available now! 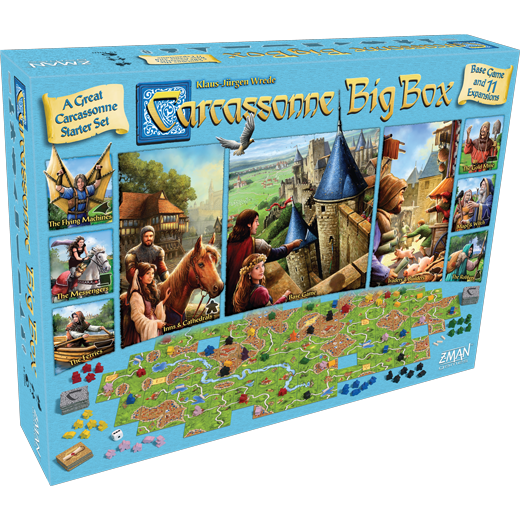 The Carcassonne Big Box combines the 2001 Spiel des Jahres winner with eleven eclectic expansions to create the perfect starter set for you to enter the world of Carcassonne. Along with the base game, you get the Inns & Cathedrals and Traders & Builders expansions, plus nine mini-expansions that add their own unique twists to the game. Altogether, the Big Box contains more than 150 landscape tiles for you to build with. During a game of Carcassonne, the development of the landscape surrounding this beautiful city in southern France is in your hands. With the base game, you add landscape tiles representing streets, cities, monasteries, and meadows to the board and claim those features with your meeples to score points. But with only a handful of meeples at your disposal, you must carefully decide when to place your meeples to outsmart your opponents and score the most points. Each of the game’s numerous expansions have introduced new types landscape tiles and even more meeples to add variety to the game. Within the new Big Box, you can build ferries across lakes to extend your roads, deploy robbers to leech points from your opponents, and much more. Every expansion gives you even more options for building the landscape surrounding Carcassonne and allows you to take a fresh approach to the game every time you play. Not only does the new Carcassonne Big Box provide a vast array of options for playing the game, it also gives you the freedom to customize your Carcassonne experience as you see fit. The base game and expansions can be played in virtually any combination, meaning you have the power over what tiles and meeples you use, how complex your game is, and how long you play. With so many options on the table, no two games will ever be the same. You could begin with the base game only and slowly incorporate the expansions beginning with Inns & Cathedrals and Traders & Builders. Or you could dive right in and play with several mini-expansions like The Gold Mines and The Crop Circles all at once. The mini-expansions are not complicated on their own, but combining them can create complex and unique game situations unlike any other game of Carcassonne. It’s also possible to only use parts of the expansions, giving you even tighter control over the challenges you’ll face in each game. Individual components like the big meeple and the builder can be seamlessly added to any game based on your personal tastes. With so many options available, the Carcassonne Big Box gives you the power to play, test, and build your own Carcassonne! Since its initial release, Carcassonne has immersed players in a world full of exciting possibilities while offering deep but accessible gameplay. Immerse yourself in this world with the Carcassonne Big Box, on sale now!